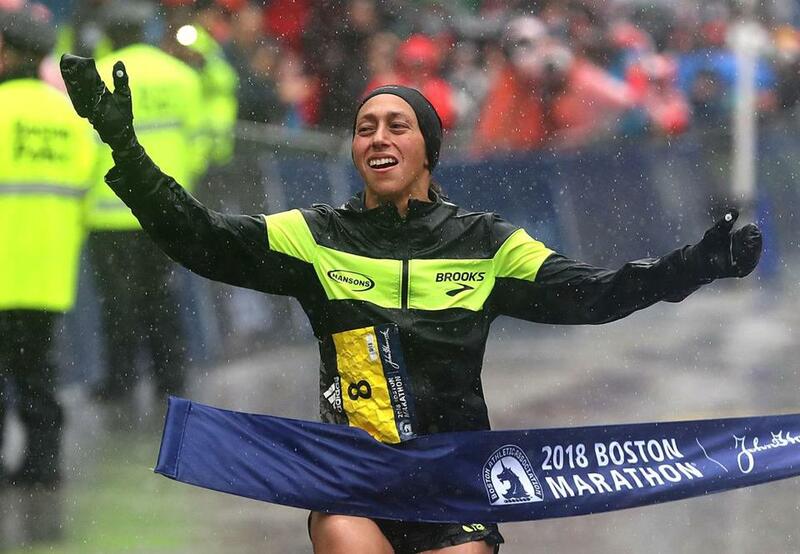 Desiree Linden, female winner of the 2018 Boston Marathon, crossed the finish line. Elite Boston Marathon runners take home more than just the glory of the race — the fastest man and woman each take home a six-figure check as well. John Hancock Financial Services, the main sponsor of the marathon, is giving away over $860,000 in prize money this year to the top finishers of the overall race, masters, and push-rim wheelchair divisions. The fastest man and woman each walk away with $150,000. Second place for each category takes home $75,000, and third place receives $40,000. The top men and women runners in the masters division — those who are 40 and older — will take home $10,000 each. Second place receives $5,000, third receives $2,500, fourth receives $1,500, and fifth receives $1,000. Prizes in the push-rim wheelchair division went up since the 2018 race. The fastest man and woman in that division will now take home $25,000, up $5,000 from last year. Second receives $15,000, also $5,000 more than the winner in last year’s race, and third place receives $7,500, $2,500 more than in 2018. And if you happen to be a racer who breaks a world or Boston Marathon record? There’s a prize for that, too. If a man can beat the world record of 2:01:39, he’ll get an extra $50,000. He has an extra 5 seconds to beat the Boston record of 2:03:02 — that would net him $25,000. For women, the world and Boston records are 2:15:25 and 2:19:59, respectively, with the same prizes awarded. Men and women masters runners who break the world record in their division win an extra $10,000, and busting the Boston record nets them $7,500. The push-rim wheelchair bonus prizes match those figures. Abbi Matheson can be reached at abbi.matheson@globe.com. Follow her on Twitter at @AbbiMatheson.